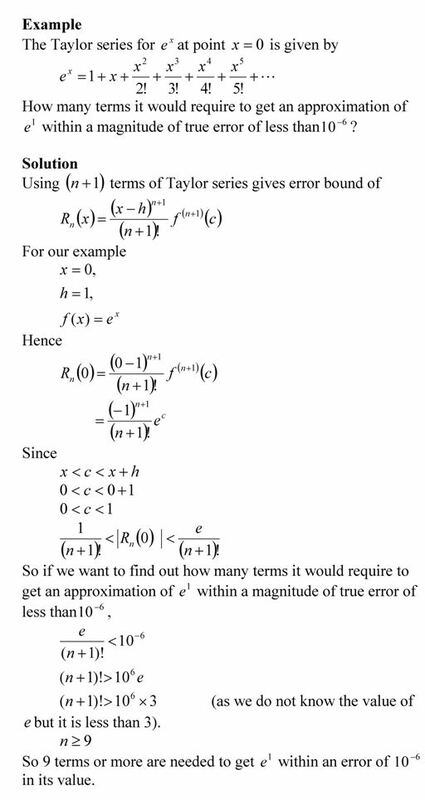 So how many terms should I use in getting a certain pre-determined accuracy in a Taylor series. One way is to use the formula for the Taylor’s theorem remainder and its bounds to calculate the number of terms. This is shown in the example below. This post is brought to you by Holistic Numerical Methods: Numerical Methods for the STEM undergraduate at http://numericalmethods.eng.usf.edu. An abridged (for low cost) book on Numerical Methods with Applications will be in print (includes problem sets, TOC, index) on December 10, 2008 and available at lulu storefront. I feel this article is very good��. It�s not only interesting; it helps us readers to ponder on the subject. I m very impressed with your work, and I look forward for more of it�. Congratulations on your good work�. Where does the magic ‘h’ variable come from? The magic h is part of the Taylor series. See http://numericalmethods.eng.usf.edu/mws/gen/01aae/mws_gen_aae_spe_taylorseries.pdf for details. May I take in you example h as 100 or 1000?